Barbie's a computer geek this year, but Huffington Post has a slideshow of the least inspiring Barbie careers. McDonald's employee! Miss America! American Idol winner! Aerobics instructor! Some of these aren't really uninspiring, but flipping through the slideshow is pretty fun, anyway. 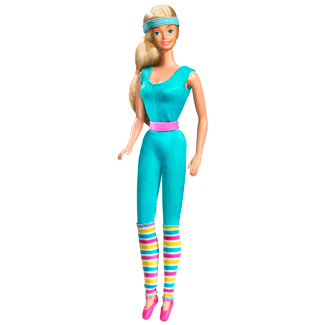 Which Barbie did you -- or your friend, sister, or cousin -- have? Hm... I had the Barbie McDonald's playset, so I guess my Barbie owned it? Barbie and the Rockers. The "band" came with a cassette tape and were dressed like someone smashed the guys from Warrant and the cast of Clarissa Explains It All together. 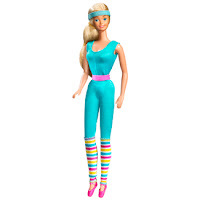 I had Olympic gymnast Barbie. I believe that was during the Nadia years. I remember having four Barbie dolls when I was a child. The first was Malibu Barbie (only natural for a little girl growing up in the 70's with family members in California! ), Ballerina Cara (the African-American version of Ballerina Barbie whom I chose because she wasn't just the same old blue-eyed blonde), Superstar Barbie (my favorite one of all) and one in a yellow jumpsuit with short(!) curly hair. I can't remember what she was called -- all I remember is that she had very short curly hair and came with two wigs (one long blonde wig and one shorter light brown wig). Oh, and I also had a Skipper doll -- the one who went from a preteen to a teenager with a rotation of her arm (her waist lengthened to give her a little more height and her chest grew, although not nearly as much as Barbie's).